Welcome to NRIDS Nepal ! 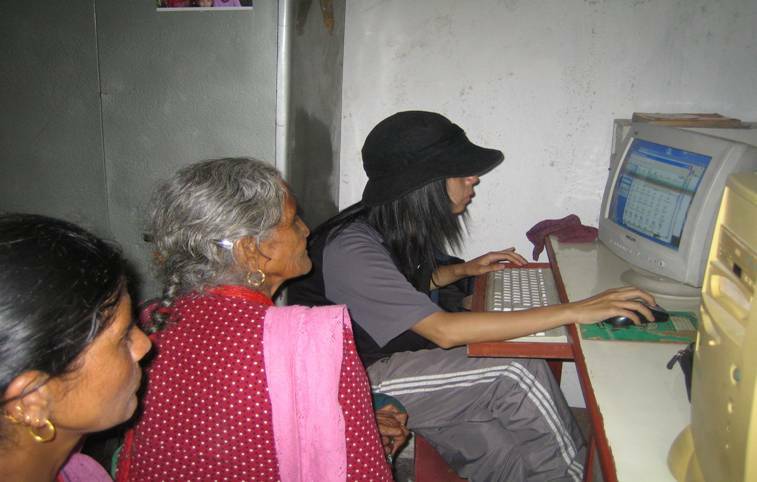 Computer centers in the Syangja district of Nepal are facing a connectivity crisis. Entire villages get email and browse the internet through the equivalent of the cellular phone you carry in your pocket. Cellular internet bandwidth is billed by the minute. As NRIDS information centers become increasingly popular costs are rising to prohibitive levels. Often, shared connections at cellular speeds are not fast enough to support today’s high bandwidth internet. Stuck on slow connections, many rural Nepali communities are being cut off from the electronic resources the western world takes for granted. NRIDS has a plan to solve the connectivity crisis. Using the same inexpensive wi-fi hardware installed in homes and coffeshops throughout the western world, NRIDS hopes to build a wireless repeater on a high ridge-top at Kharsuko Lake. NRIDS has technically skilled volunteers willing to implement this project for free, but has no funds to purchase the necessary radios and antennas. All it takes to make this network possible is USD $8000. Please donate now by clicking the button to the right of this page and help connect residents of Syanjga with each other and the rest of the world. Established in 2004, NRIDS operates at the national level through the network of Community Information Centers (CICs); and shares the experiences and innovative concepts to the like minded people all over the world through the international knowledge networks. With an unique blend of the social focus, NRIDS and its local CICs, deliver Information and communication Technology (ICTs) services to the rural areas of Nepal, providing advocacy, awareness-raising, and policy reform. It works in a three layered architecture. It suggests central government for the policy reform and innovative planning, aware and prepare local governments/NGOS about the national/international Standard practices of ICTs and aware the grassroots communities about its Importance. When the Rural communities are fully aware about ICTs, NRIDS provides training and consultancy for CIC establishment and lobbies with the government, national and international donor agencies for further growth. So this parallel layered approach assures the preparedness for ICTs implementation in all levels. As CICs are community owned the project supports development of local content and knowledge management, human capacity and human resource development. NRIDS felicitates to create an environment for viable information access and help stem rural migration to urban areas for accessing information and ideas. Community Information Center, established in Astam, Kaski District,Nepal A Community Information Center was established in Astam village of Kaski District on 15th May 2007 With the support of Nepal Rural Information Technology Development Society (NRIDS) and active participation of the local people living in the Pokhara city and the local people of Atam. This center provides the basic functionalities of a library, Local Information enter, and the meeting point of the people for various discussions and decision making. NRIDS Dhankuta formed with the objective of bringing ICTs revolution in remote areas of Dhankuta District. The committee consisted of the people from different profession to act as Dhankuta ICTs Task force. This Task Force is determined to work for the e-governance preparedness and ICTs awareness throughout Dhankuta District. NRIDS Members Trainied by Inveneo Inc.
To upgrade the expertise on wireless internet and VoIP a training was organized by Inveneo Inc. from 2 - 6 August in Chamber of Commerce, Sunsari, Dharan. Members from NRIDS Nepal and volunteer from Netherlands participated the training. Two student from Radboud university Nijmegen (www.ru.nl) Mr. Jos Groenewegen, Mr. Daan Pijper arrived in Kathmandu on 29th July 2009. Their main objective is to research Telecentres operated by NRIDS. During their stay in Nepal they will visit and analyze telecenters and provide necessary suggestions for running efficiently in future. They are making a documentary and a report of Telecenters after they return back to their university. Currently, NRIDS is not registered as a US 501(c)(3) organization and donations are not tax deductible. How Community Information Centers help rural people?